OTTO Revo NC2 Noise-Cancelling Microphone Now Available | Magnum Electronics, Inc.
OTTO recently introduced a new patent-pending noise-cancelling remote speaker-microphone compatible with most popular 2-way radios. The Revo NC2 rugged microphone has a submersible rating of IP68 but still has a receive-only audio jack. The V2-R2ER1212 is compatible with the Harris P5300, P5400, P5500, and P7300, XG-75, and XG-25. There are two Kenwood choices – the V2-R2KB5112 with a multi-pin connector for NX200 or the V2-R2KA5112 for ProTalk and models with a 2-pin connector. OTTO also released the V2-R2MF5112 microphone for Motorola APX and MOTOTRBO XPR 6000/7000 series models. There is also the V2-R2MG5112 microphone for CP Series, PR400, BPR40, and others with a 2 pin jack. Working in a high noise environment requires hearing protection. The NC2 has a 2.5mm or 3.5mm audio jack for a receive-only earpiece or dual muff headset. We recommend the 3M Peltor HT Series Listen-Only models available in headband, neckband, or hardhat mount. 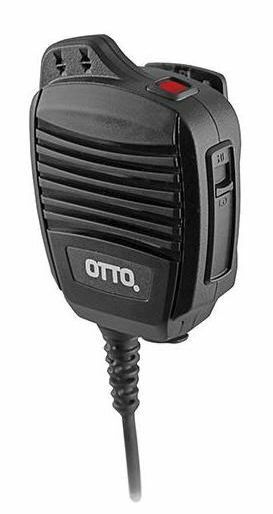 OTTO is a leading manufacturer of two-way radio accessories located in Carpentersville, IL. Founded in 1961, the company has a reputation for high quality public-safety grade audio accessories. Magnum Electronics, Inc is an authorized dealer. This entry was posted in APX Radios, MOTOTRBO, New Products, Portable Radios, Public Safety and tagged 2-way radio, communications, firefighters, military, OTTO, police, Revo NC2 by magnumelectronics. Bookmark the permalink.